The Obamas were out and about during lunch today. 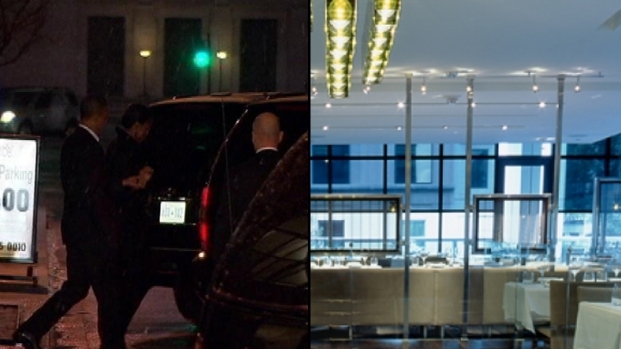 While Michelle and the girls were spotted strolling around Bethesda, President Obama -- who celebrates his 50th birthday tomorrow -- headed out to Good Stuff Eatery with staff members who worked on the debt negotiations. The group includes Office of Management and Budget Director Jack Lew, Assistant to the President and Director of Legislative Affairs Rob Nabors, Assistant to the President and Deputy Chief of Staff for Policy Nancy Ann DeParle, Chief of Staff to the Vice President Bruce Reed, and Director of the National Economic Council Gene Sperling. 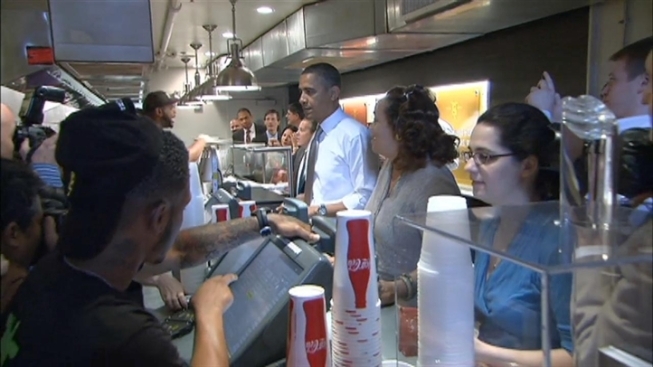 While waiting in line at the counter, Obama chatted and took pictures with patrons and Good Stuff employees. He told the cashier he would pay for his staff, as well as lunch for a woman standing next to him in line. The presidential crowd snagged a long table by the window in the second-floor seating area -- we're impressed they managed this feat during a busy lunchtime, but hey, he is the president. Obama chatted with a family seated at the next table, offering Andrew Parker, 11, a choice of several milkshakes from their group. "I guarantee this table isn't going to drink them all," Obama said, according to Parker. Rep. G.K. Butterfield (D-N.C.), who was en route to pick up lunch at a nearby Chinese restaurant, also popped in for a quick chat with Obama. "We talked about the difficult vote the other night," he told reporters outside. "I explained to him that I didn't vote with him, but I'm glad that it passed. He said he understood." The president had a burger, fries and a salad in front of him -- but there's no word on whether he dined on his or Michelle's namesake items. Celeb chef Spike Mendelsohn, who owns Good Stuff (303 Pennsylvania Ave S.E.) and its younger sib We the Pizza, has both an Obama Burger and a Michelle Melt on the menu. Mendelsohn created the Obama Burger -- which Michelle, Sasha and Malia have tried -- in collaboration with White House chef Sam Kass, who previously cooked for the Obama family in Chicago. The burger is topped with horseradish mayo, red onion marmalade, crumbled blue cheese and bacon. The Michelle Melt is healthier, clearly a nod to the first lady's Let's Move initiative. The burger of free-range turkey includes fresh, organic and/or local ingredients: caramelized onions, Swiss cheese, lettuce, tomato and South Lawn herb garden mayo, on a fresh wheat bun. The first lady has said it's her favorite thing on the menu. "Michelle eats here all the time, but I don't get out," Obama admitted.